At the centre of the clock face forming the pivot of the hand are engraved the arms of Poland impaling Visconti under a crown. Around the body of the clock, three sets of arms are engraved in circles: those of Poland (a snake devouring a person) under a crown, Lithuania (a knight on horseback), and Visconti (a spread eagle) also under a crown. All are flanked by foliage decoration. On the underside are stamped four representations of the arms of Bona Sforza (Sfortia), daughter of Giov. Galeazzo Duke of Milan, great-granddaughter of Philip Visconti, the last Duke of his race. 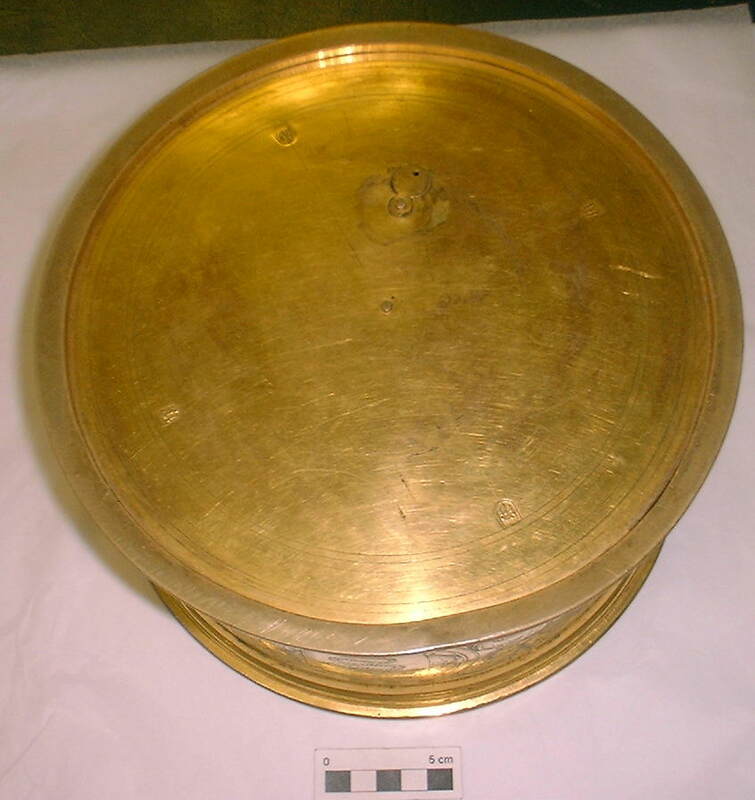 An astronomical clock of gilt brass in the form of a circular flat box. The upper face is the dial graduated in twenty-four divisions, in the centre of which appear the arms of Poland and Visconti. The body of the clock is covered with engraved decoration. 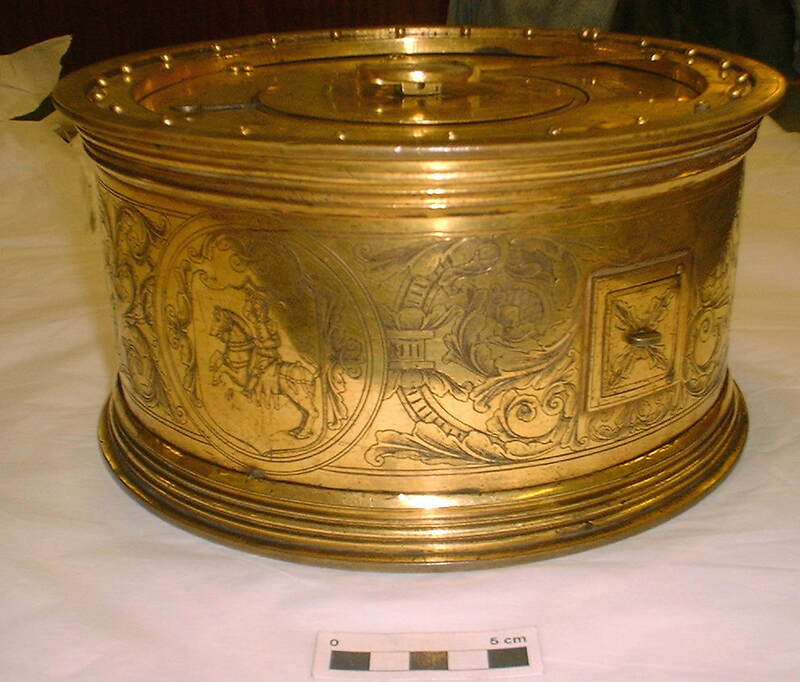 The last image shows the spirial working section, which is the oldest know type of this design in Britain. The clock probably belonged to the King of Poland, Sigismund I, who married Bona Sforza in 1518. The clock may well have been made for her. The Hon. Daines Barrington commented in his observations on clocks, written in 1788, that: "Mr Peckitt, an ingenious apothecary, of Compton Street, Soho, hath shewn me an astronomical clock which belonged to the late Mr Ferguson, and which still continues to go. The workmanship on the outside is elegant, and it appears to have been made by a German in 1525". Henry Peckitt considered it to be the oldest clock in England. The Society of Antiquaries possesses a wooden stand for this clock. Note: The inscription is engraved in a circle around the clock face below the engraved symbols of the zodiac. 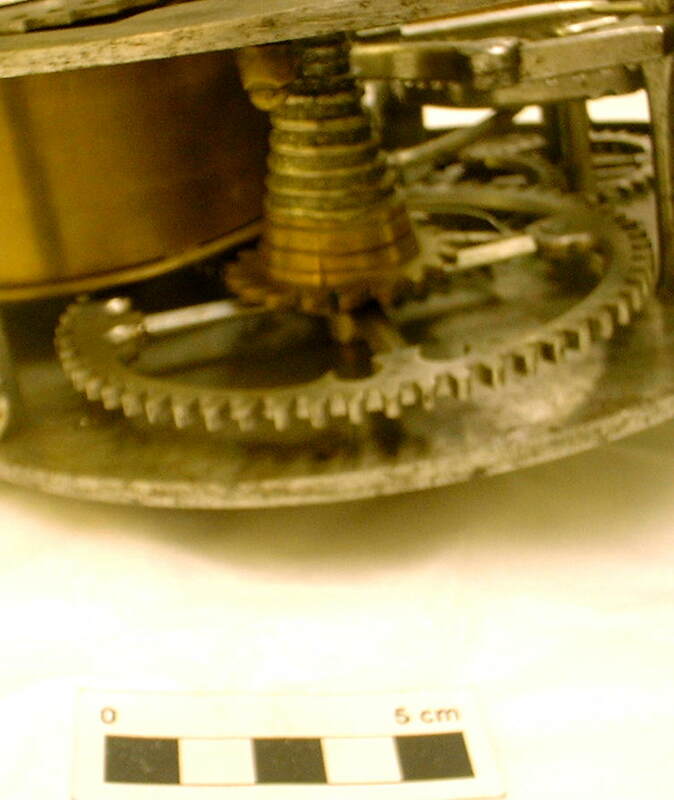 Note: Inscription forms part of a circle inside, and concentric, to the outer edge of the clock face. Note: Roman numerals engraved in a circle around the outer edge of the clock face. Text: DAMAN. ZALT. 1.5.2.5. IAR. DA. MACHT. MICH. IACOB. ZECH. ZV. PRAG. IST. BAR. Note: The inscription is engraved on the barrel inside the clock. 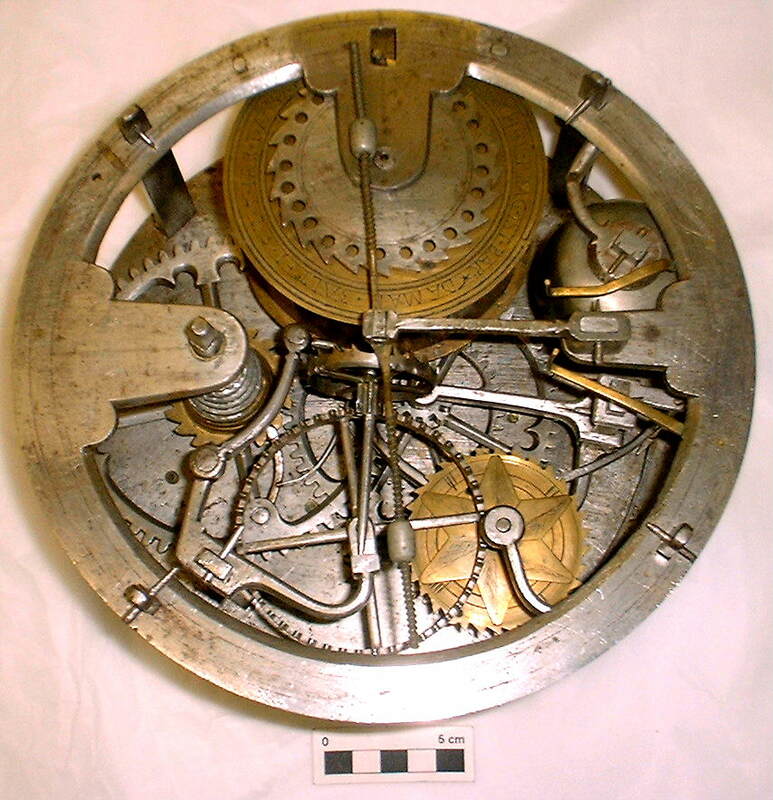 Note: Arabic numerals engraved in an incomplete circle inside, and concentric to, the outer edge of the clock face. Note: Arabic numerals engraved in a circle inside and concentric to the outer edge of the clock face. Note: Inscription consists of six characters which form part of a circle inside, and concentric to, the outer edge of the clock face. Possibly in Greek script. Note: Bequeathed to the Society of Antiquaries, and came into their possession on 19th May 1808. Note: Henry Peckitt purchased the clock at the sale of the effects of James Ferguson, the mathematician. Daines Barrington. 1779. Observations on the earliest Introduction of Clocks. Archaeologia, vol. v, 424. H Otto, 'The Famous Fusee Clock of Jacob Zech', Horological Journal (1931): 176-8. Smyth, W. H. 1849. 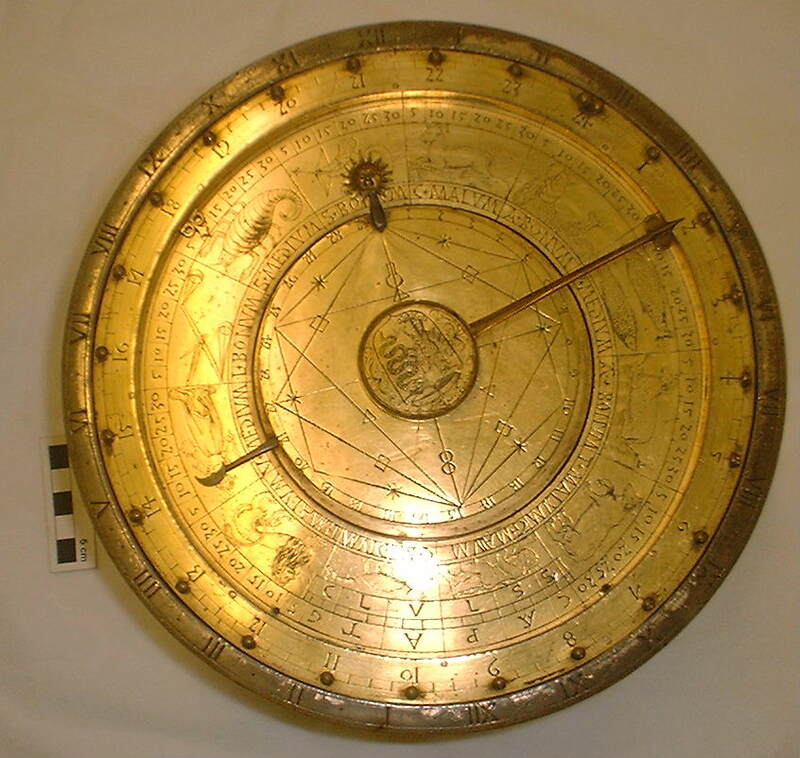 Description of an astrological clock, belonging to the Society of Antiquaries of London. Archaeologia, Vol. 33. 8-35. Society of Antiquaries, Minutes, vol. xxxi, 513.